Mrs. 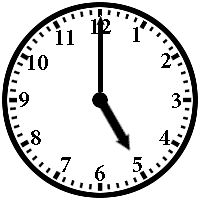 Wise will be keeping the library open until 5:00 on Wednesdays for students who need to use the library's resources or need a place to use Wi-Fi. We wanted to make sure teachers knew that this opportunity was available to all students. In an effort to create a culture of reading and literacy at Glass, we rolled out our iRead posters to interested staff members prior to Thanksgiving so that staff members could record what they are reading. The goal for this initiative is for our students to see that reading is important, that adults within our building are reading, and to hopefully start conversations about books and materials being read. If you didn't get a chance to request a poster but would like one, please email Sarah Mabery. If you have a quote you would like printed on your poster, please include that in the email. 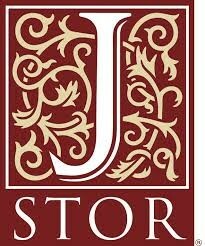 The library paid for a subscription to JSTOR this year. Our subscription provides access to peer-reviewed, full-text scholarly research for all of our patrons. "It also helps teachers enrich their classrooms with key scholarly literature across more than 50 disciplines." If you need assistance finding resources through JSTOR or want to see what it is all about, come by the library so we can help you. 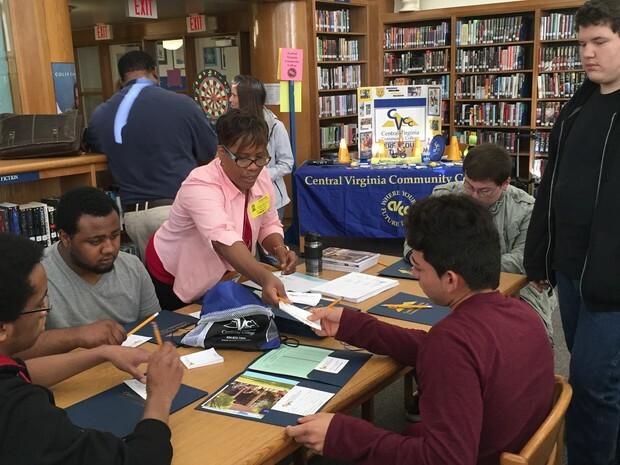 Mrs. Vande Hoef reserved the library again this year for Virginia College Application week during the week of November 16. It is always an amazing experience to see our seniors applying and even getting accepted during onsite admission days. Mrs. Vande Hoef, the counseling department, and college volunteers did another great job of helping our students navigate the college application process. 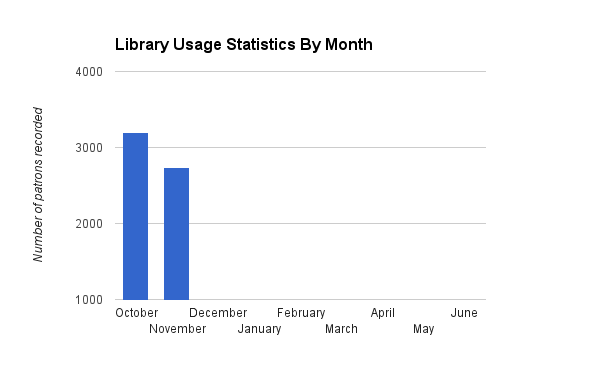 For November, we logged 2743 instances of patrons using library services. We tried to accommodate as many patrons as possible by going to classrooms to teach classes while the library was being used for Virginia College Application Week. 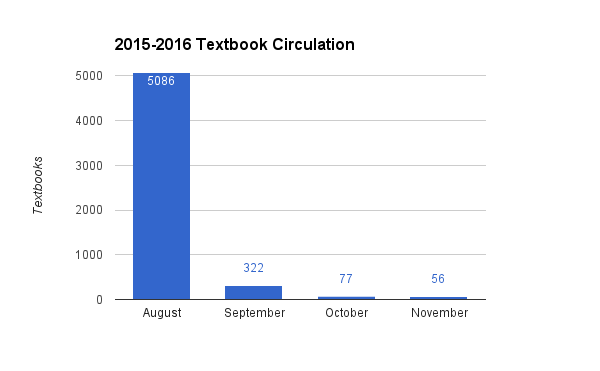 Please continue to login and ask students to login so that our data is as accurate as possible. Thank you! 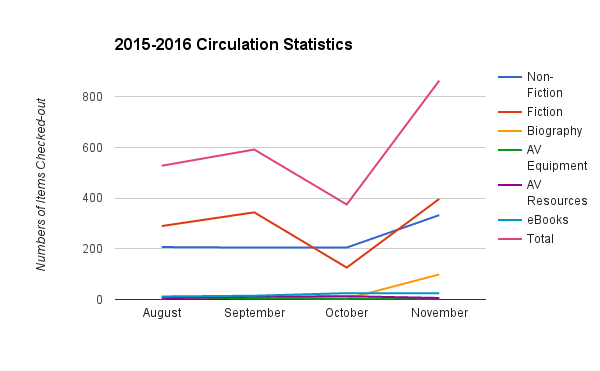 The library circulated 864 items during the month of November. Our fiction and non-fiction books were in high demand as English teachers assigned independent reading assignments to their students. We would like to thank them for supporting the library!